Summer is in full swing! Travel and tourism are peaking as people flock to their favorite destinations to experience vibrant cities, towns, and natural beauty. This year, there has been particular attention placed on some very special and popular vacation spots in the United States: our national parks. This year marks the 100th anniversary of the National Park Service, and in celebration of this milestone, national parks around the country are asking visitors to come see for themselves why preserving these parks is worthwhile. National parks not only protect wildlife, conserve land, and connect people to nature, but they also address human impact on our environment through creative sustainability initiatives. I have grown up visiting Acadia National Park on Mt. Desert Island in Maine (which is also celebrating its 100th anniversary this year), and have seen first-hand how their bus service is an effective and sustainable program. The Island Explorer runs throughout the entire park and beyond and provides free transportation to many hiking trails, walking paths, and popular scenic areas. 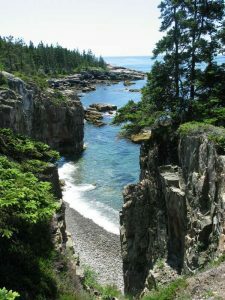 Visitors can conveniently get to and from hotels, campgrounds, shops, and the many attractions within Acadia National Park. The Island Explorer also benefits small businesses in the surrounding Park towns. Because parking is limited and traffic is highly congested, the Island Explorer gives a hassle-free transportation option for tourists who want to patronize the local businesses, but may otherwise avoid going into town. Although initially implemented with tourists in mind, local residents use the bus service as well. Many of these locals work at the restaurants, hotels, and retail stores in town; giving the employees of these small businesses a free and sustainable way to commute to work. 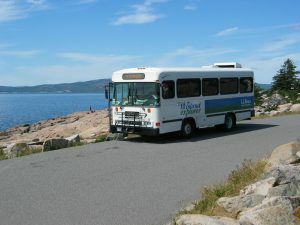 The bus service not only offers convenience for visitors who do not want to deal with the traffic and parking in Acadia, but it also has great environmental benefits. When one considers that the population on Mount Desert Island consists of only 10,000 year-round residents, the impact of nearly 3 million people visiting the island during the summer is significant. The air pollutants from the millions of cars that visit the park have caused acid precipitation and haze over some of the most scenic spots. The buses are propane-powered, and between the Island Explorer’s inaugural year in 1999 and their 10th year in 2009, the bus service has prevented over 10,250 tons of greenhouse gases and 16 tons of smog-related pollutants. Those totals are steadily rising as more and more visitors use the bus each year; 2015 saw a daily average of 6,075 riders which is 6% higher than 2014 and 26% higher than 2013. Speaking from experience, the buses are always full and are very well regarded by visitors and the community. Many other national parks have also implemented sustainability initiatives that set good examples for how individuals, small businesses, corporations, and communities can reduce their environmental footprint. Zion National Park, located in southern Utah, has set up water filling stations around their park with free access for all park visitors. The park sells Zion National Park reusable water bottles at a low cost, and consumers are eager to participate as there was a 78% increase in water bottles sold after the filling stations were installed. The National Park service estimates that 60,000 plastic water bottle sales are prevented, which is equal to eliminating 5,000 pounds of plastic waste. Big Bend National Park, located in Western Texas, replaced their lighting fixtures in one lodge, multiple restaurants, an amphitheater area, and along the pathways with new LED lights that reduced energy consumption and greenhouse gas emissions by 98%. The project has also decreased light pollution and significantly improved the quality of the park’s night skies. In addition, the initiative has provided a substantial cost savings for Big Bend National Park. Annual energy costs are at $164, significantly down from $3,293 before the replaced lighting. These are just some of the successful changes nationals parks have made in an effort to be more sustainable. The benefits seen through Acadia’s bus service, Zion’s water filling stations, and Big Bend’s lighting renovations are helping the environment while also having positive impacts on locals, visitors and small businesses. These sustainability initiatives can serve as great examples for individuals, businesses and organizations to replicate back in their communities, and businesses can start by taking the Root360 sustainability assessment to see what types of initiatives could have the greatest impact. Now, how about some vacation time and a trip to one of the beautiful National Parks?